Owls are everywhere. They’re on buildings, schools, signs, kid’s t-shirts and their lunch boxes. 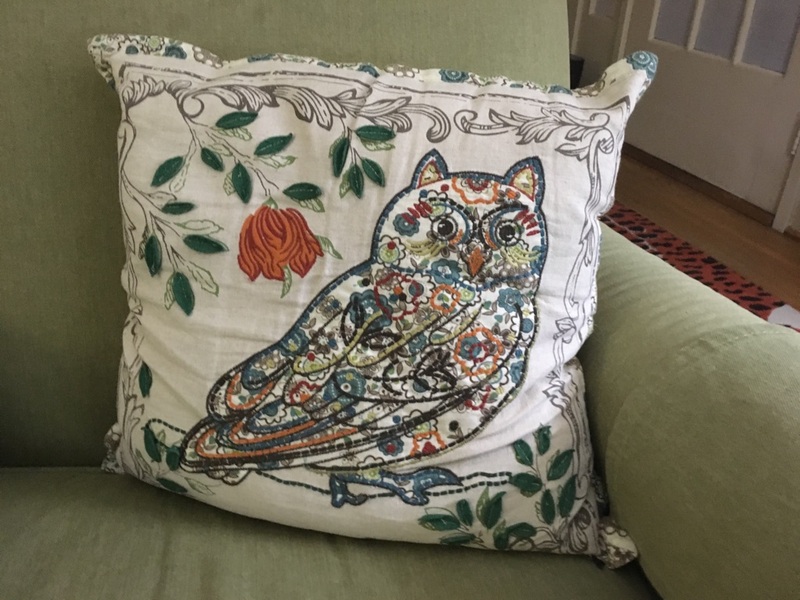 I can’t go anywhere in my own home without seeing an owl. I’d like to say I’m owl indifferent but that’s only when I’m not seeing them everywhere. I prefer real owls with big yellow eyes and rotating heads to the cartoon variety. If owls ever got a bad rap it would be because too many people have turned them into cutesy, cartoonish images and not portrayed them as the gallant woodland creatures they are. Caricature may be an expression of owl love and appreciation, a way to create joy from fun images, but I say it’s overkill and too much joy. By spotlighting this out of hand owl phenomenon, I’m hoping to stop these cartoony depictions of owls and get them the respect they deserve. 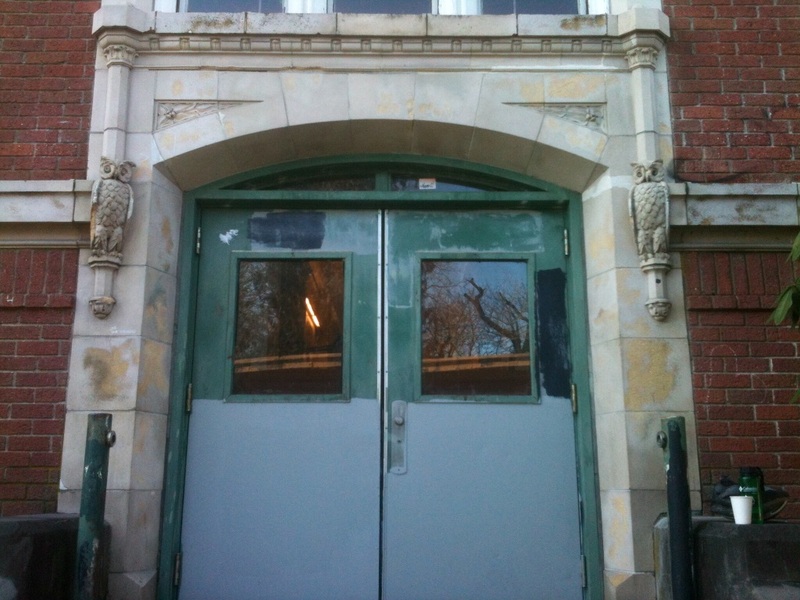 This pair of owls intrigued me when I saw them at the Kellogg Middle School in the Foster-Powell neighborhood of SE Portland. Owls have that reputation for being wise. I’m not sure if these birds represent the school’s mascot but they embody what learning will get you if you stick with it. It’s funny, owls are wise without ever attending school. 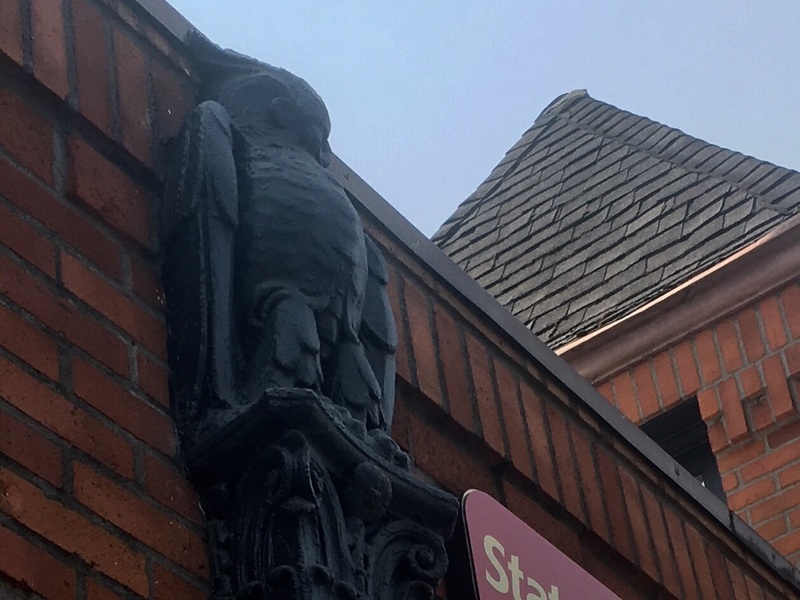 The owl on the State Farm building on West Burnside St. downtown is an ornamental part of a downspout. 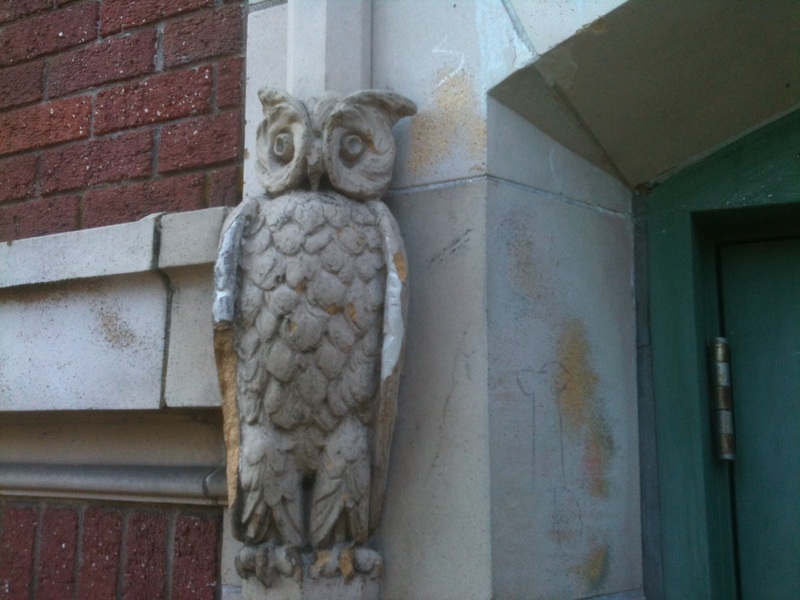 Maybe it’s subtle and hard to see, and in my case, hard to photograph, but an owl with bulky, arm-like wings that’s part of an old brick building is a cool thing indeed. 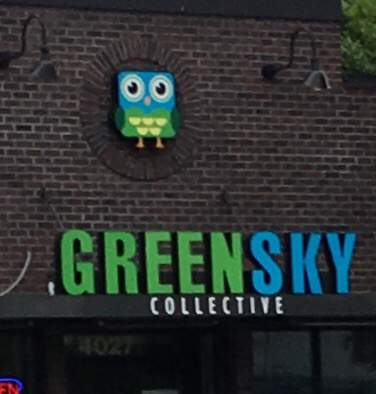 GreenSky Collective cannabis dispensary, now called Jeffery’s, used a squat Owl Jolsen looking caricature as a symbol for their business. It’s hard to say if it was good for business. It’s possible that if you sampled their product you might experience owls in that vivid technicolor visual pattern used in their logo design. 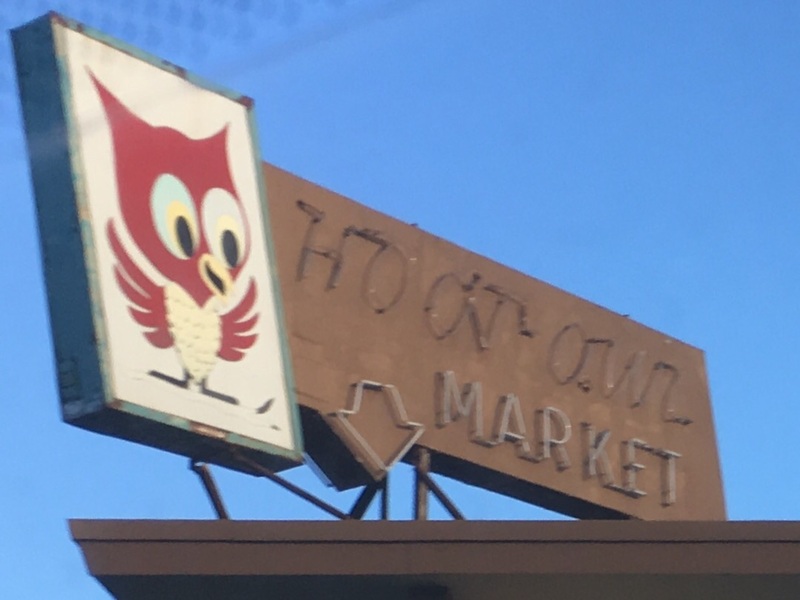 If your business is called the Hoot Owl Market on SW Capitol Hwy, it’s a given what image will be on your sign. This owl is a hoot. He’s friendly. He wants a hug. His red coloring is attention grabbing. It’s a less offensive portrayal of owls in my view. A realistic looking owl sitting on a roof as if he’s ready to swoop down on shoppers would not be good for business. This owl looks like he’d be your goofy best friend for a few minutes encouraging you to buy Pringles. Hey you’re The Perch in St. Johns so why isn’t there a fish on your sign? Okay, I get it, owls hang around in the forest on a perch. The owl on the sign has been perched on a bar stool so long drinking beer and eating jo jo fries that he’s gotten round. 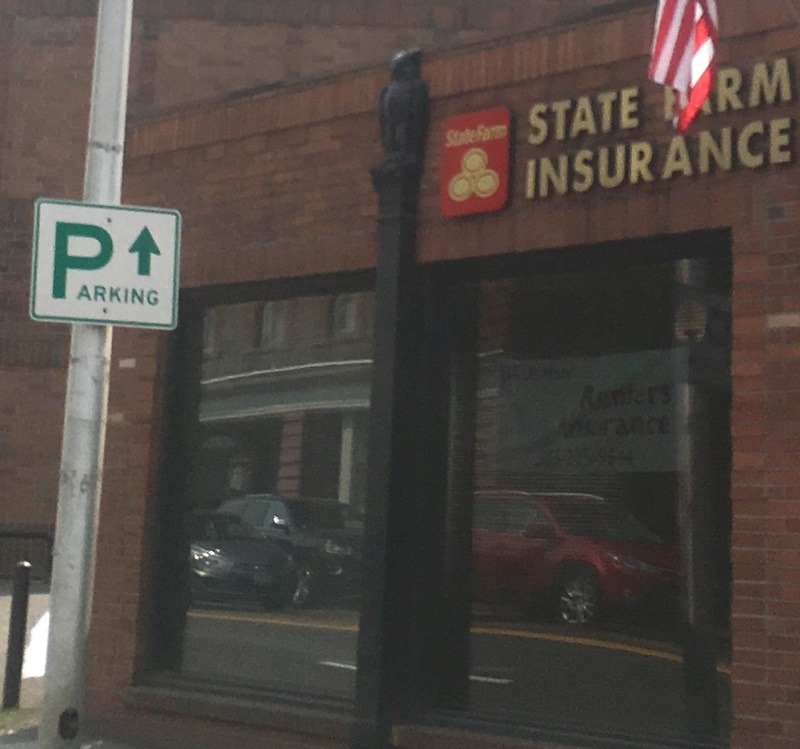 What does this owl add to the sign design? Ah hell, of course, that owl makes the whole world smile. I, myself, can’t even go back to Frownland after seeing him. “Delightfully tacky yet unrefined,” is the Hooters motto as seen on the clock face on the other side of this sign. The tackiness come from hooters being a nickname for a part of their waitresses’ anatomy and having little to do with owls but owls hoot and have big round eyes that in a logo design can be made to look like the aforementioned anatomy. I’m not trying to be crude as much as I just really enjoy circular logic especially when it alIows me to break out words like aforementioned. The owl is portrayed in as authentic way as possible except for the orange eyes which are the restaurant’s colors but unnatural for owl eyes. The beauty of it all, for the owl’s sake, is that being Hooter’s mascot means it’s unlikely that owl’s wings will ever be on the menu. 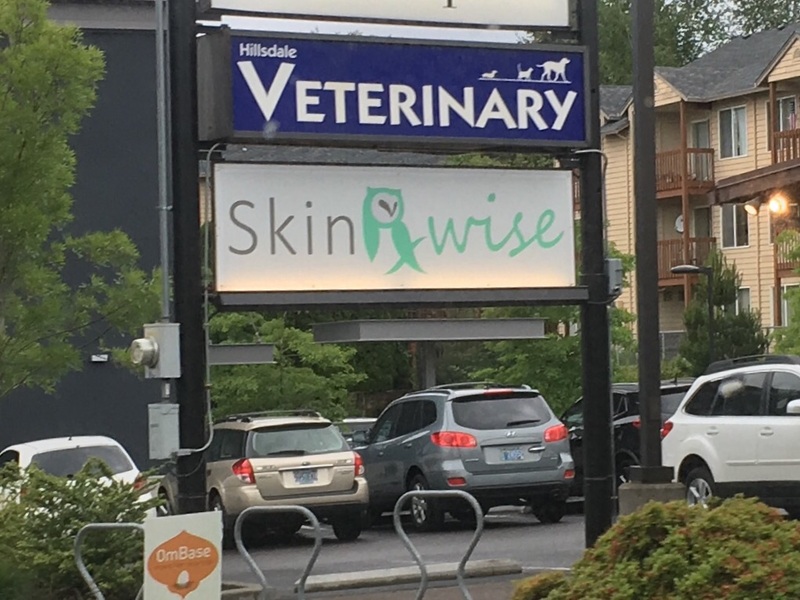 Skin wise takes the cake using a literal owl reference and image with their business name. 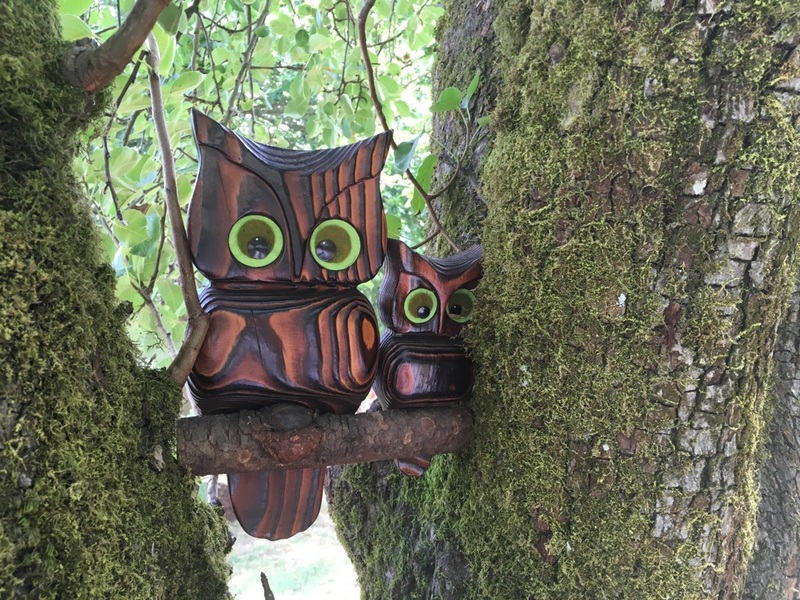 It’s simple, artsy, abstract and sophisticated and a different take on the usual breed of owls. It’s all the things you want owl images to be. It occurred to me that owls have smarts but not skin. Do they represent the product that well? Who cares? Consider that a business name like Feather Wise would never bring in enough customers. While trying to put this story to bed I felt surrounded. Just because you’re paranoid doesn’t mean owls are lurking everywhere, with those over sized eyes staring away. 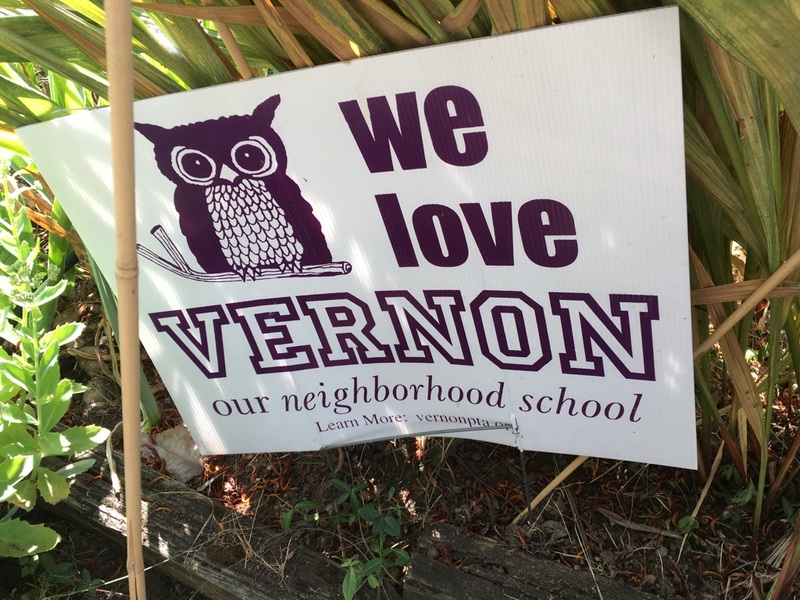 On the way to the Alberta Street Fair I saw a sign for Vernon Elementary School, another school with an owl mascot. While this sign expresses love for its neighborhood school, I’ll try to find love for owls or be less annoyed by them. Hiding out in the trees near the Pittman Addition Hydro Park in the Overlook neighborhood of North Portland, this decorative pair seems a bit kitschy, retro and out of place. Since when does nature need to be decorated with imposter owls? Then again if it’s this tasteful and fun, I say decorate away. 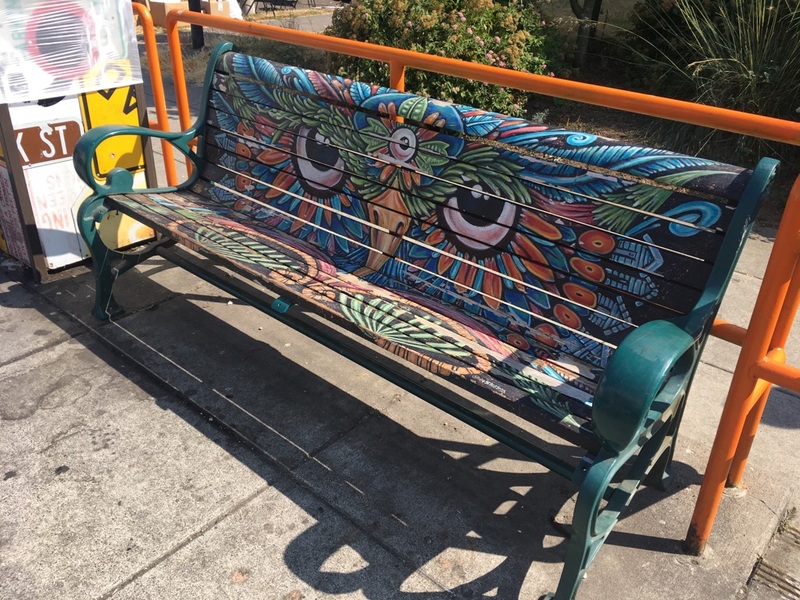 I was interested in painted benches on Alberta Street. I didn’t realize until later that this was a brightly decorated, psychedelic, owl possibly of Aztec descent. The look in his eyes makes me think he might be angry about people sitting on his beak. I can’t imagine how many more owls I’ll see since I’ve opened this can of owls. Perhaps, by now, you’re as sick of them as I am.